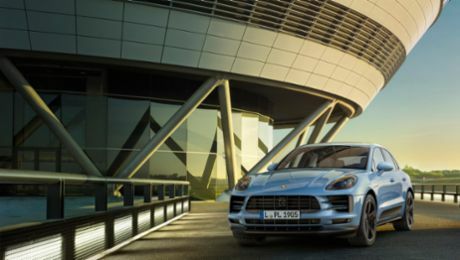 Practice is the name of the game when you are undergoing vocational training at Porsche Leipzig. Pascal Haußner and Tim Heuer are agreed on this. The pair are both third-year automotive mechatronics apprentices focussing on passenger car technology and have just completed a very unique practical project: They have refitted a Cayenne Turbo as a multifunctional circuit vehicle for the Sachsenring. This involved replacing, cladding and adapting the headlights and tail lights as well as fitting the vehicle with a modern LED light bar, as used in the sports car world championship or Formula 1. The converted Cayenne is also equipped with several fire extinguishers for firefighting. At the beginning of this week, Porsche handed over the vehicle to the Road Safety Training Centre at the Sachsenring. In future, the vehicle will be used to assist circuit operations during driving events – as a lead vehicle, safety car or medical car. Pascal Haußner and Tim Heuer (l-r) working on the Porsche Cayenne Turbo. This is not the first time that trainees have put a special vehicle on the road: There is already a ball-collecting vehicle for a golf club and a “goalie car”, which Bundesliga team RB Leipzig uses at events as a target for fans to kick towards. Such projects are very useful for a comprehensive training programme, says trainer Dirk Siebeneichler (PLG-MT): “The important thing is to systematically and independently work on a vehicle over a long timeframe – as well as developing ideas of your own. That prepares you for day-to-day work later on.” And you can be proud when you see the result of your work and everything functions just as you imagined. Pascal Haußner and Tim Heuer were also recipients of this valuable experience when they were able to hand over the operational vehicle on Monday at the Sachsenring in the company of Managing Director Siegfried Bülow. The handover of the Porsche Cayenne Turbo at the Sachsenring.